Breakfast has always been my favorite meal of the day and until recently, the meal was incomplete without some type of egg preparation. After moving to the US, I experimented with the Frittata and many different types of omelets and simply loved all of them. I honestly didn’t think I’d get bored with eggs, but a few weeks ago, I did. Pushed by my boredom and my husband’s constant requests to learn how to make a few Indian breakfast dishes, I took the recipe for Poha from my Mother. Poha is a form of flattened rice that has a lower cooking time than regular rice grains. It absorbs liquid when soaked in Milk or water and essentially becomes good to eat right away, which makes it a very convenient, yet nutritious food. Different regions of India use the grain in a variety of preparations. 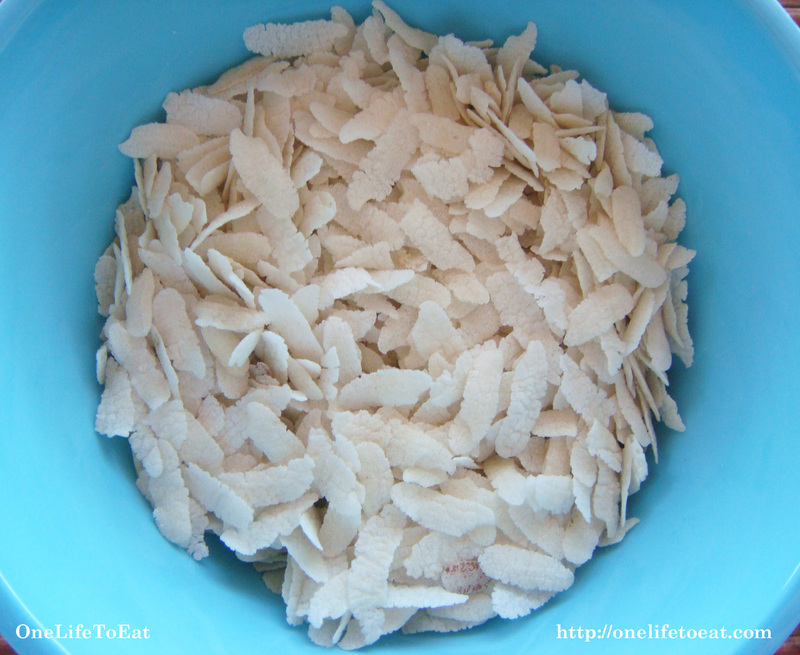 The grain is used in main courses, crunchy snacks, desserts and breakfasts. My recipe for Poha is a Breakfast dish that hails from the state of Gujarat in Western India, where most people are vegetarians. I’ve seen people from some ethnic communities in India have it as lunch and some serve it as a snack with evening chai as well. The grain is available in large packets at Indian grocery stores. 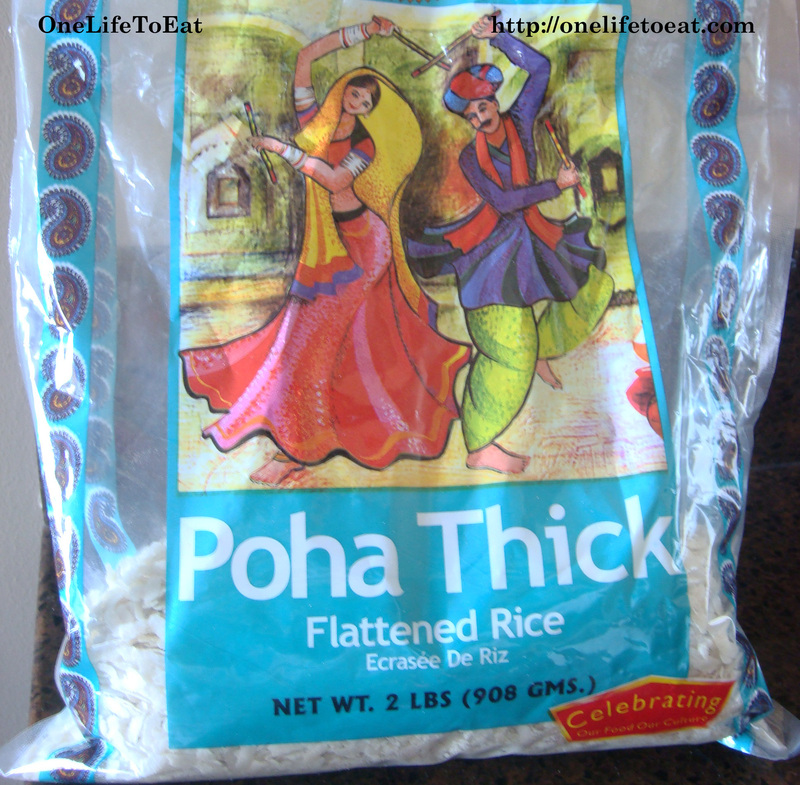 2 different varieties of Poha are available – Thick Poha & thin Poha. 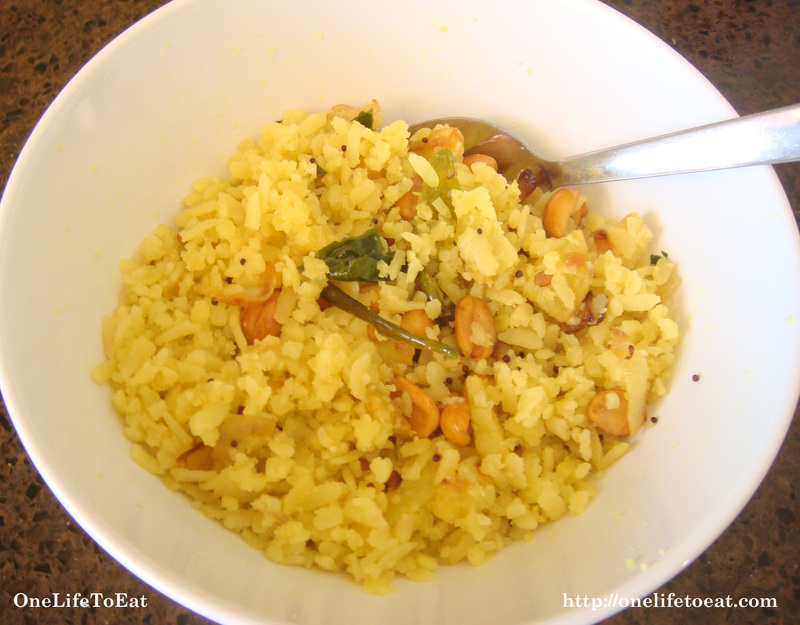 For the breakfast dish, we need to use the thick poha. Prepared with peanuts, curry leaves and potatoes, this humble breakfast dish is spiced with black mustard seeds, whole green chilies and curry leaves. I have noticed that when I have a big bowl of Poha for breakfast, I feel less hungry and have fewer cravings the rest of the day. Fry the potatoes till they are cooked through. This shouldn’t take much time – about 10 minutes. WAw Thanks for introducing flat rice to us. I could never guessed what it is in a life time! Your recipes makes me hungry! OMG, I want this right now – but for dinner! Breakfast for dinner has always been my favorite thing – feels like cheating somehow! When I went to the Indian grocery 2 weeks ago, I remember looking at Poha and wondering what to do with it – now I know! Thanks, Sabera! Glad the post makes you want to try this Jenn. Hope you like it. I personally took some time to like Poha. Never liked it as a child and even in college where it was served in the cafeteria. Or maybe I just like it when I make it? 😉 Either way, I really enjoy it now. Hope you do too! That is so lovely, Sabera! I love it,hmmmm! I also adore Indian packaging, it is so wonderful- colourful and cheerful! Wish all packaging was like it! Adding chopped tomatoes gives it lovely colour and a bit of tang to taste. We Gujaratis also add sugar so that it’s sweet and spicy at the same time. Its wonderful when the extra spice of coriander chutney is added to it! Thx for the tip Chandani!